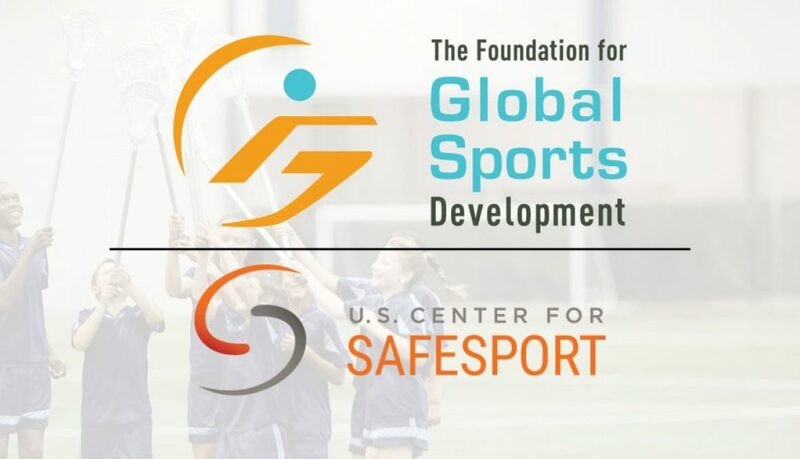 Denver, Colo. (Jan. 29, 2018) The U.S. Center for SafeSport, a national nonprofit focused on ending all forms of physical, emotional and sexual abuse in sport, is the recipient of a $200,000 grant from The Foundation for Global Sports Development (GSD), a nonprofit that creates and supports programs promoting sportsmanship, education, fair play and ethics for children around the world. The grant will fund a project focused on helping parents, coaches, and clubs communicate with young athletes about emotional, physical, and sexual abuse. With the GSD grant, The Center will develop a robust, downloadable online curriculum, printable resources, age-appropriate training videos, and educational toolkits to help parents, coaches and sport administrators communicate with their athletes. Resources will be rolled out and developed over a period of 6 to 8 months and will be available on the Center’s online portal at www.safesport.org. In addition to the $200,000 grant, GSD will support an education symposium, furthering the work of the Center and bringing together key stakeholders in the sports industry. The Center is the first and only national organization of its kind focused on ending all forms of abuse in sport. As an independent non-profit headquarter in Denver, CO, the Center provides consultation to sport entities on prevention techniques and policies, while developing best practices and educational programs focused on promoting athlete wellbeing and putting an end to emotional and physical abuse in sports. The Center also provides a safe, professional and confidential place for individuals to report sexual abuse within the US Olympic and Paralympic Movements. All of the recipients of our Athletes in Excellence Award are more than impressive athletes – they are incredible role models. 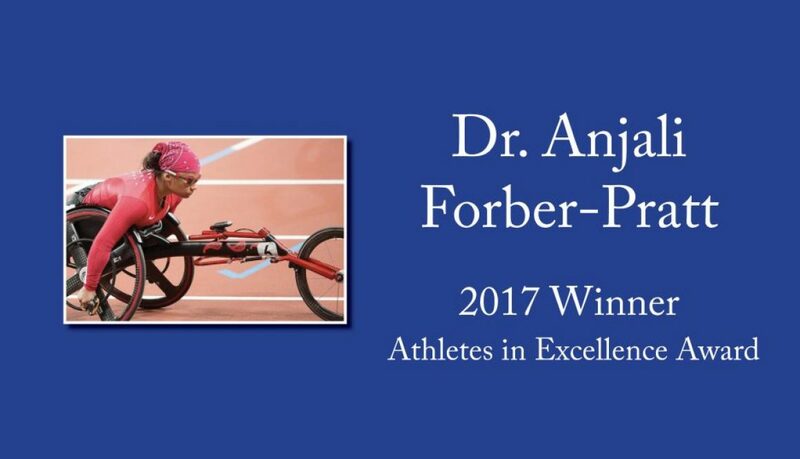 Dr. Anjali Forber-Pratt has gone above and beyond as an athlete, educator, and advocate. We are excited to share her story and name her a 2017 Athlete in Excellence. Dr. Forber-Pratt was nominated by Katy Sullivan. Anjali first encountered Para sport at the Boston Marathon when she was five years old. As she watched the race, Anjali was overcome with awe when a group of wheelchair racers swiftly moved down the course towards the finish line. As a young girl who also used a wheelchair, this was a huge moment in Anjali’s life – a turning point. Anjali’s family adopted her from Calcutta (now Kolkata) when she was two and a half months old. Just after her first two months in the United States, doctors diagnosed Anjali with the neurological disorder called transverse myelitis. This disorder, caused by an illness, resulted in inflammation of the spine and, ultimately, paralyzation from the waist down. From the time Anjali was very young, her parents instilled in her a strong sense of independence and determination. These traits would serve her well as she grew up to become an elite athlete, advocate for herself and other young people with disabilities, and researcher and professor. After Anjali’s eye-opening experience at the Boston Marathon, she immersed herself in the world of sport, participating in track and field, downhill skiing, table tennis, and swimming. By the age of nine Anjali was competing at the national level in track and field. While she was directing a great deal of time and energy in her pursuit of sporting success, Anjali knew sport was just one part of her life. Anjali excelled in school, but she also had to advocate for herself. While in an honors English class, a teacher asked Anjali why she was in the class and indicated Anjali wouldn’t be able to attend college due to her disability. On the first day of high school, Anjali was heading to her homeroom when she suddenly came upon a stairwell that led to the classroom. In response to the school’s inaccessibility, Anjali – at age 14 – took on the school in a lawsuit that lasted four years. All during the process Anjali understood she wasn’t doing this for herself, rather she was removing obstacles for future students with disabilities. After graduating from high school, Anjali attended the University of Illinois, Urbana-Champaign, where she graduated with the Highest Honors and earned her B.S. in Speech and Hearing Science and an M.A. in Speech Language Pathology. In 2012, Anjali also earned her Ph.D. in Human Resource Education from the University of Illinois, Urbana-Champaign. By the age of nine, Anjali was already an excellent wheelchair racer and competing at the national level for several years until she crashed in a road race when she was 13 years old. In the crash she had broken both wrists, which forced her to take a break from wheelchair racing. However, her determination and love of sports led her to shift her focus to downhill skiing, which placed less stress on her wrists. After many years of success in downhill skiing, Anjali found her way back to wheelchair racing in 2006. In 2008 she represented Team USA at the Paralympic Games in Beijing, where she won two Bronze medals. Anjali has also held records in the 4x100m and 4x400m. 2008: Second place, 100m and 200m; third place, 400m, Meet in the Heat, Atlanta, Ga.
2003: Third place, 200m, 400m; Fourth place, 1500m, 800m, 100m, Junior National Wheelchair Games, Hartford, Conn. While Anjali’s passion for sports continues, she has also directed her energy towards her work as an assistant professor at Vanderbilt University and in helping grow Paralympic sport in developing nations. As a researcher she examines identity, equity, and empowerment for people who are different from the rest of their community in some way, with a focus on disability. She has traveled to Bermuda, Ghana, India, and Zambia to help develop Paralympic sport. Here she leads clinics and workshops for athletes with disabilities, coaches, and volunteers. As part of her work, she also meets with officials about disability policy in the country. In addition to this Anjali has mentored youth with disabilities; presented at workshops, conferences, and seminars; and has visited hundreds of schools to speak to youth about Paralympic sport. She has also been involved in many different organizations related to sport, disability, and education. And check out her Athlete Spotlight video for the 2017 Athletes in Excellence Award below and learn more about her service to the community!